Worshippers light candles as they attend Christmas mass at Saint Antuan Church in the Beyoğlu district of Istanbul. While Christmas is certainly not a holiday celebrated predominantly in Turkey, you might be surprised at all of the many ways the country's expat residents rally together to spread holiday spirit, sing carols and celebrate with festive feasts. Check out all of the ways you can prepare, shop or celebrate with foreigners in Istanbul, Bodrum and Fethiye. InterNations, the world's largest professional expat networking community, which also has an active branch in Istanbul, will be holding their annual "Holiday Expat Event" at the chic Shangri-La Bosphorus in Beşiktaş. This will be a festive networking event in which drinks and food will be discounted and the music will be low enough to allow for conversation. The event takes place on Saturday, Dec. 8 from 7 p.m. to 11 p.m. Tickets for basic members are TL 50 ($9.30) and for their Albatross Membership TL 20. Expats with foreign IDs that are not signed up for the event will be charged TL 60 for entrance, and all guests will be served a complimentary drink. For Christmas carols: On Sunday, Dec. 16, from 5:30 p.m. to 7 p.m., the Pera Diriliş Kilisesi will be holding an evening of "Noel Ezgileri," in other words "Christmas Carols." This newer Anglican Church, located in Beyoğlu's Aynalıçeşme neighborhood, is a Turkish-language Church of England congregation that is frequented by Christian members of the expat community. There will be Christmas hymn readings from the Book of Common Worship in Turkish and the opportunity to discuss Christmas and what it means. Circolo Roma, the Italian Cultural Center housed in the Casa d'Italia in Tepebaşı, will be hosting "Dolci Natalizi," a very special Italian Christmas desserts cooking class in which participants will get to learn how to prepare neapolitan struffoli, croccante and zabaione with pandoro taught by Italian expat Francesca Rosa. Cihangir's new Latin restaurant Azucar will be hosting a Christmas celebration on the eve of Monday, Dec. 24 in which a traditional Venezuelan holiday dish will be prepared. The popular summer holiday destination of Bodrum, which also serves as a haven for a significant portion of the nation's expats, is a great place to spend Christmas as there are a number of events that bring the foreign community together. First and foremost, for nearly two decades now, Bodrum municipality has held a special event on Boxing Day, which falls on Wednesday, Dec. 26, to celebrate the region's foreign community for Christmas. The event draws in hundreds of expats residing nearby and takes place in a festive atmosphere at Trafo, which also happens to be one of the best municipality cafes ever due to both its views and impressive stone buildings. Leading up to the event, on Friday, Dec. 14, there will be rehearsals for children to sing carols and on Sunday, Dec. 16, Trafo will also be holding a "Holiday Fair." On Wednesday, Dec. 19, Vira's Hotel and Restaurant in Yahşi will host their eighth annual "Pre-Christmas Lunch" from noon to 6 p.m. with roasted turkey and Christmas pudding. Over the weekend of Dec. 21 to 23, Kefi Beach in Bodrum will be hosting a holiday market, where people can peruse or pickup handmade crafts as gifts. On Saturday, Dec. 22, Sugar and Salt, an international restaurant popular with the expat crowd, will be hosting a "Christmas Market" to benefit the Smiling Dogs shelter from 11 a.m. to 5 p.m., which will have all sorts of handmade gifts as well as secondhand items. On the day of Christmas, Tuesday, Dec. 25, Pubness, an Irish pub located on the main marina thoroughfare, will be preparing a traditional Christmas dinner in which attendants can order a plate at TL 15, with turkey, stuffing mashed potatoes and gravy and lots of veggies, anytime starting from 3 p.m. to midnight. Not to be outdone by Bodrum, the expat community in Fethiye center and Hisarönü also have a lot going on to get you into the holiday spirit. There will be four carol services organized by Fethiye Community Church that will be held in different venues in Fethiye. 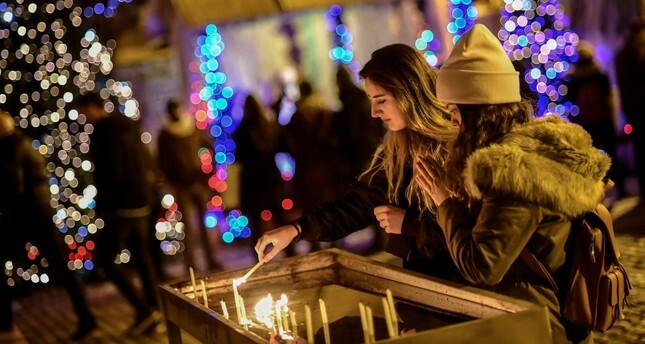 On Dec. 14, there will be carols at Abrahkedabrah in Ovacık, on Dec. 18, there will be carols at Nil Bar in Çalış, on Dec. 20, carols will be held at Mancero in Fethiye proper and on Christmas Eve, Dec. 24, there will be carols sung at Fethiye Community Church. All carol singing sessions will begin at 6 p.m. The Carnival Restaurant in the heart of Fethiye will be hosting "A Merry Little Christmas Party" in aid of the Animal Friends of Turkey on Thursday, Dec. 13 starting at 7 p.m. In addition to a lavish menu of international fare with roast beef and souffle potatoes being the main, there will also be a raffle with luxurious prizes. Tickets are TL 125 and proceeds will go to assist street animals. In Fethiye, there will be many options to enjoy a festive meal with fellow foreigners on Christmas day itself. The expat-owned Mulberry Tree, Summer Breeze, Our House and Mancero, which will be dishing up both beef medallions and turkey, will all have special menus on Christmas Day. In Hisarönü on the day of Christmas, K Bar & Gastrolounge will be preparing a fancy feast with all of the traditional favorites such as chicken liver pate, Yorkshire pudding, Christmas pudding and even a Bailey's cheesecake.